I saw this dress on the internet and kind of loved it. I traced it back through a few tumblrs to its source, only to find out that it's from Swedish designer Ida Sjostedt's couture line and is inaccessible to me for a bunch of reasons, such as having to go to Stockholm for an appointment. So I'm wondering if you or your readers have ideas about dresses (available in the US!) that are similar to this one. I'm not wedded to specific elements of this dress (open to different sleeve lengths and necklines, for instance), but I like that this dress feels modern and even stylish, while still looking feminine and romantic. Thoughts? There are a couple of quite lovely options if you search 1950s + 1960s at Mill Crest Vintage. Which is from the 1940s. Who knew? Tis the season when brides fall in love with dresses on Pinterest and freak out about where to find em. I've got another such post on deck for tomorrow. You could piece it together with a couple of elements. 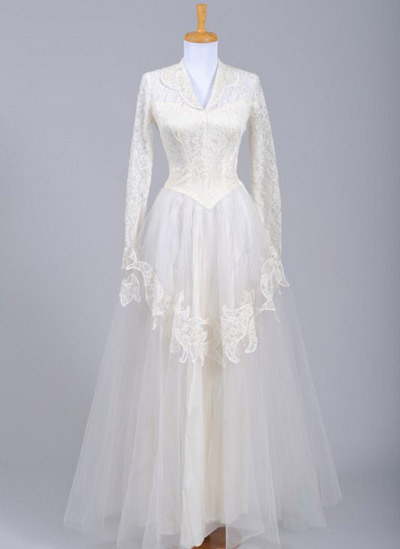 Take a three quarter length jacket (I know ESB hates BHLDN but they have a good example) likethis and a tulle skirt like this (but with a higher waist) and finish it with a silk sash or ribbon. Good luck! This is a good solution, especially for those of us who aren't going to fit into most vintage options. Another combo is this top with this skirt. The vintage options are beautiful, but I don't get think they say "modern..., while still looking feminine and romantic." I third the tulle skirt with a separate top option. Here is another skirt option. For tops, what about this tulle top with sheer beaded arms? Or lace, like this, this, or this? 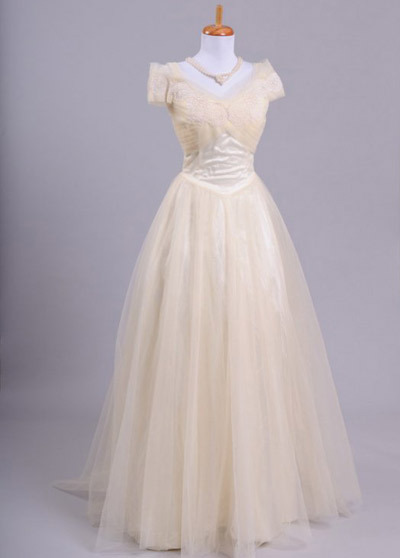 I was hoping I would get a chance to show this lovely vintage strapless gown to somebody! It's from a local vintage bridal boutique in Portland,Xtabay. While they do have an Etsy site, from looking at their blog and Facebook it seems that they keep the prettiest stuff for local shoppers, the ladies that run the shop are pretty amazing and would probably be happy to help you. And, as usual, Elizabeth Dye kills it with a modern take on a vintage feel. That second one is incredible. Wish I had seen that before I got my dress. Have you qctually tried on dresses at all? You might not actually like that look on you - I highly recommend going to a store first - saw a similar dress to that in a few stores. I had something very specific in mind myself (Downton Abbyesque square neckline sheath) and then found out I was really digging something less costumey. It happens. Leanne Marshall has dresses that look similar to me. This one is very close (although shorter). How about "For Emily" from Elizabeth Dye? She has more dresses than are shown in her Etsy shop in her lookbook from 2012 as well as 2011, and a lot of retailers that sell her dresses are linked in the sidebar. Yes. Thought of Elizabeth Dye right away. This one (available here) is similar but short. I really love the back. This gown is divine and on final sale but perhaps not tulle-y enough. Solution: Print that photo out; bring it to bridal salons in your town. Let them find it for you. If that doesn't work, take that photo to a talented seamstress in your town. See if she can make it for you. This, for sure. 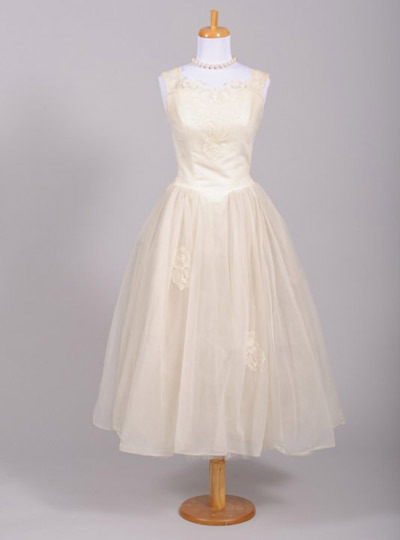 I wanted something vintage-inspired, but still modern, and thought it wouldn't be possible in my price range, but I ended up finding my dress at the first bridal shop (in my Podunk Midwestern city, no less) I visited, and for even less than I'd been planning to spend. It's not by a designer I had ever heard of, but I didn't care. I know Pronovias and their affiliate brands make a lot of dresses with tulle skirts. The Pronovias Davis 2013 might work. By the way, that was meant to be in response to anon 8:19.
the gentleman, whose name i forget, who did my best friend's fitting was AMAZING. i am almost positive that if you showed him that picture he could replicate it. It's almost identical to the long version of the Bardot dress with shrug at Stephanie Allin (also available in tea length) you can get it in the uk so not sure about the US but definitely almost identical.